Living in Los Angeles, I am happy to drive anywhere in the city in search of good food. But, it’s even better when the restaurant is only a couple minutes from home. Cadet opened at the very end of 2014 in Santa Monica and it couldn’t be a more welcome addition to the area. Located in the former The Shack space, next to the Verizon store on the corner of 26th and . It feels like you have entered your own living room. Exposed brick walls, low lighting, comfortable banquets and a bar in the center of the room are so inviting. And one of the inviting elements is the wood fired grill that can be seen through a glass window when you first walk in. 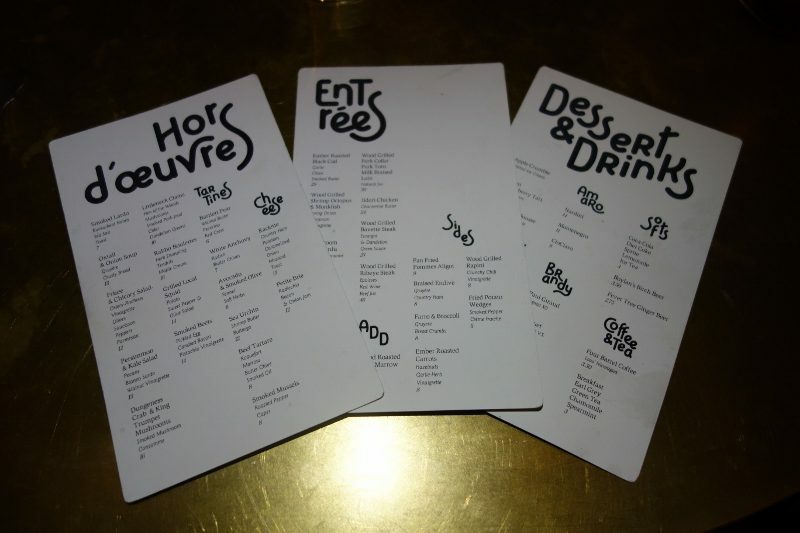 The menu is presented like a deck of cards and you lay them out in front of you like you are reading tarot cards. Tourists go to Tel Aviv to visit the beaches, wander the markets and explore the cultural history. Some also love to eat their way through the culinary capital of Israel, where Eastern European, Mediterranean and Middle Eastern cultures have come together. Tel Aviv is also a city that is known for its vibrant nightlife. It is a 24/7 city that blends the best of Los Angeles (beaches and warm weather) and New York (diverse and metropolitan). But, it wasn’t only the lively nightclubs that have attributed to the growing cocktail culture. With craft cocktail bars opening up with regularity in Tel Aviv, there are plenty of artisanal cocktails to taste and here are four of the best spots in the city. When visiting a new city, it is always good to know someone who knows all the hidden gems. With the help of our tour guide, Yuval Soffer, we were taken to some of the local up and coming bars. I first met Yuval a few years ago when he was working in Los Angeles as a bartender. Originally from Israel, Yuval spent thirteen years in the US, working at Apotheke in New York and Fraiche, Comme Ca and Neat in Los Angeles. 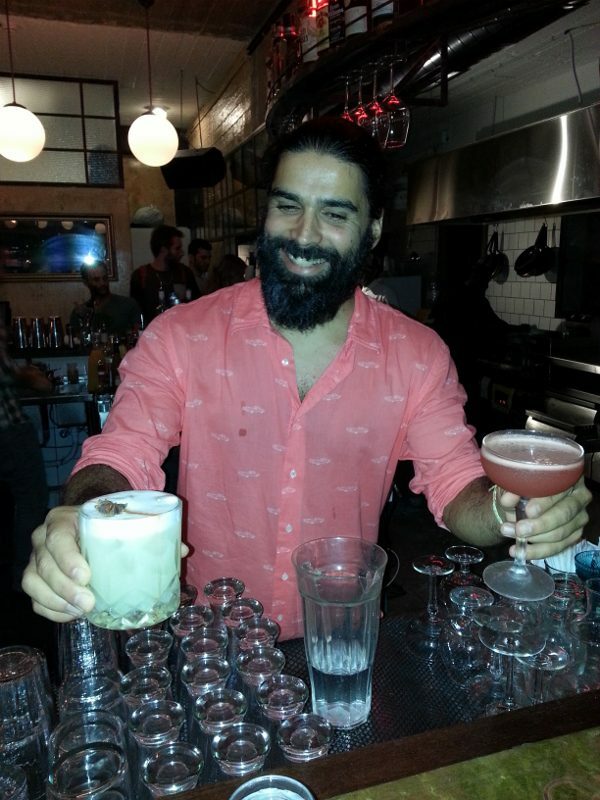 A little over a year ago, he decided to return home to Israel to get in on the ground floor of the cocktail movement that he saw was starting to develop. Yuval told us to meet him at Suramare, one of his most recent cocktail consulting projects. We were as confused as the taxi driver when he dropped us off on a quiet back street in front of an office building. We entered through the garage where images were playing on the walls and approached a hostess stand with the door list. We were directed into an empty lobby and told to go to the 10th floor. The doors opened and we entered the industrial rooftop bar that is partially covered and partially open-air with an olive tree growing in the center. From classic cocktails [Daiquiri and Capirinha] to creative cocktails, including the Charlie Chaplin with Jack Daniels, cloves, lemon, and honey and the Caprese with tomato, basil, lime, gin, Poli Airone rosso aperitivo, and black pepper, the Mama Cass with Bechkerovka, lemon, honey, egg white, Pernod rinse and the Tropic Spire with mango, lime, vodka, and shafta chilis. Here you can enjoy your drinks as you look out at the great views of Tel Aviv lit up at night. Bellboy is a 1920s themed bar that is located in a hotel. But, with funky Charleston music that sounds more like Gypsy klezmer music playing in the background and eclectic décor, including a baby carriage where oyster shooters are prepared, this bar is slightly out of the ordinary. Even the bathroom is quirky, with a macabre overtone. This eccentricity is reflected in the drinks, like the Holy Water made with Bellboy mastiha infused vodka, Bellboy eucalyptus syrup, fresh lime, dry vermouth, and myrrh and then is garnished with a smoking pine cone. Another notable mention is the Keep Clean made with premium gin, fresh lemon, fresh grapefruit juice, ouzo, and lavender air, which was served in a bathtub with a rubber ducky and straw. The bar is aptly named. With only 15 seats, this mini bar is a clandestine spot that we were told is one of the “best bars in Tel Aviv that you’ve never heard of”. It’s either a bar you hear about through word of mouth or stumble upon when wandering down the street. Opened by Amit Gilad, one of the fathers of the Tel Aviv cocktail movement, Minibar is an unassuming bar that is like an extension of Gilad’s home. This casual local bar features unpretentious classic cocktails and is perfect for a late night. Also located inside a hotel (Imperial Hotel), Imperial Craft Cocktail Bar was the first craft cocktail bar in Tel Aviv. Opened by veteran bartenders Ben Shira, Drov Alterovich and Gilad Livnat in 2013, Imperial won Drinks International’s “Best Bar in the Mideast and Africa.” This was a bar created for bartenders, where every little item matters. A reservation only bar, Imperial offers 150 different craft cocktails made with premium ingredients made in-house. While respecting the classics, their goal is to make good drinks. And, in some cases, they also have a little fun with the presentation, such as the Basil Smash made with tanqueray gin, basil, lemon, and sugar, which is then served in a flower pot. At the rate of the growth of the cocktail scene in Tel Aviv, it will be interesting to see what the cocktail culture is like the next time I visit the vivacious city.